Our bespoke walk on glass has no limitations. Once fitted, our exquisite walk on glass will look stunning and allow lots of light into your room. We design and manufacture our products, so we know to install them to achieve the best effect. If you live London – or anywhere else in the UK – contact the Finepoint team to discuss the benefits of installing walk on glass in your home or at your business premises. Call us on 01923 229 949 or send a message if you’d like a call back. If you need a structural glass floor for your business, safety will be your priority. Your installation will need to be strong enough to support the weight of anyone that stands on it, while also preventing injury due to slipping. Businesses and homes throughout London and the UK use our walk on glass. Our installations are anti-slip, so you won’t need to worry about accidents. At the same time, of course, your glass will add aesthetic value. Because we make the walk on glass we fit for our customers, we can be creative in our approach. Talk to a member of our team today to find out how we can provide you with a viable glass solution for your next project. A one-size-fits-all approach rarely works. At Finepoint Glass, we work closely with our commercial and residential customers – so that the walk on glass we install for them surpasses their expectations. With extensive experience of helping home and business owners throughout London and the rest of the UK, we excel at creating unique walk on glass solutions. Each installation is made to measure and a perfect fit. 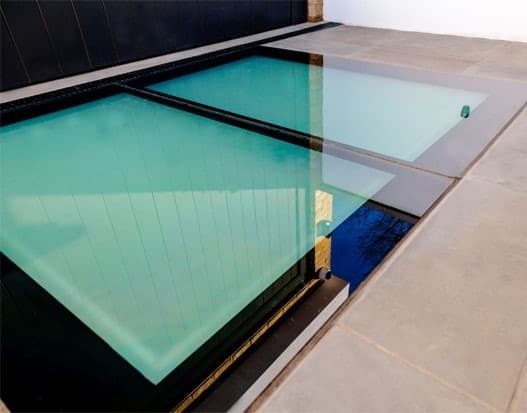 From skylights through to walk on covers, Finepoint can bespoke-design walk on glass to suit the requirements of any residential or commercial project. Find out more by calling 01923 229 949 or sending us a message. Walk on glass is practical, in that it can support weight safely. But it also provides an aesthetic benefit. Once installed in your home or business premises, your new product will transform the room below it and create a better sense of space. We will be able to help you choose the right walk on glass and site it an optimal area. Install it above a stairwell or in a floor to create stunning views of the area below (an eye-catching focal point that would look great in a restaurant). If you’re based in London – or any other location in the UK – contact our team to find out more. We can provide you with technical information about our thermally efficient designs and share with you examples of our project. Finepoint will help you with every aspect of your project. From design through to implementation, we’ll work with you to ensure everything goes smoothly. Why not get in touch today to find out how we can help? Ask us about how we can tailor your walk on glass by using the best specialist coating or anti-slip finish. Would you prefer clear or opaque? We can install your new product in either format – so ask for details when calling. Whether you live in London or elsewhere in the UK, you won’t have to manage multiple points of contact when you choose Finepoint. That’s because we design, manufacture and fabricate our products at our factory. We have extensive experience in designing and fitting walk on glass for commercial and residential customers in London and UK-wide. Our creative approach means that we can find a solution that spans all essential criteria – resulting in an installation that excels: structurally, performatively and aesthetically. Because our walk on glass is made to measure, you won’t need to worry about restrictions that might limit the scope of your project. Visit our Projects page if you would like further inspiration, or to see examples of work we’ve completed for our commercial and residential customers. Interested? Then contact us for details. If you need walk on glass for an important project, we will welcome the opportunity to talk to you. Please call us directly on 01923 229 949 or use our contact form to request a callback, in which case we’ll get in touch very soon. Examples of our work can be viewed directly by visiting our showroom. So that we can give you our full attention, please use our booking form to make an appointment – we’ll then arrange for a member of our team to spend time with you. If you need help with more than walk on glass, please ask about our aluminium sliding and bi-fold doors, wine cellars and special finish. We look forward to helping you with your enquiry.